This article is a collection of thoughts, impressions and sights experienced during a first time visit to the City of Venice in Itay, intended for those who come here for just a few days. 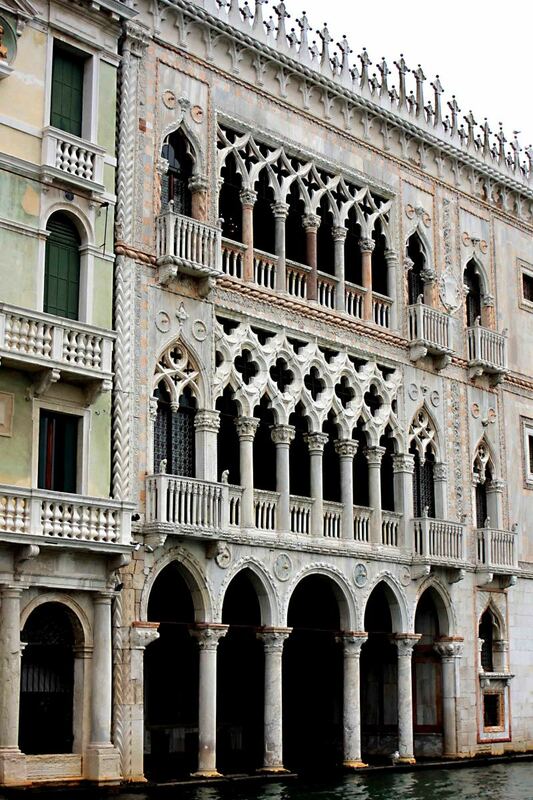 A brief overview of the fascinating history is included, but it is not a detailed study of all things Venetian - there are many other excellent websites where one can explore every aspect of the city. This city is, by any criterion, quite unique. There is no other place in the world quite like it. If ever there was a candidate for a vibrant modern day city to be included as one of the seven wonders of the world, Venice is surely that city. How then to make the most of a short visit? The City of Venice is steeped in long history and most unusual geography, and although this article is a guide to getting the most out of a tourist visit, that history and geography are key to the reason why so many flock here every year. Therefore, some mention should be made of these aspects to help explain why this extraordinary and most beautiful city exists. See 'Venice - The City on an Island'. However, if you wish to read only about present day tourist attractions and tourist advice, then jump to the section 'Accommodation'. The origins of Venice are ancient; the first settlements on the islands of the sheltered Venetian lagoon probably date at least to the final days of the Roman Empire, although fishermen had been gaining a livelihood here a long time before that. By the 5th to 6th centuries AD successive waves of Germanic tribes - the Huns, the Goths and then the Lombards - were raiding the lands of Northern Italy and many refugees were fleeing before them. The Venice lagoon offered a sheltered haven from the maurauders who lacked boats of their own, and so the arrival of refugees quickly expanded the population here. Effectively this is when Venice was founded. As settlements on the islands grew, location would prove all important to their future survival and prosperity. By the 6th century the focus of Roman power had long since shifted from Rome itself to the eastern city of Constantinople in modern day Turkey, and this great distance from the protective authority of the Empire (now referred to by historians as the 'Byzantine Empire' to distinguish it from the previous Rome based Empire) meant that inhabitants of the islands largely had to rely on the surrounding waters and their own resources to protect themeselves from the mainland tribes. It meant that the whole region from its earliest days was obliged to practice a degree of self-government. And it was not long before the settlements began to unite into a new city. Constantinople appointed its first leader - the first duke or 'Doge' of Venice, but by 726 AD Venetians had taken this duty upon themselves. As well as helping to shield Venice from invading tribes, and obliging a degree of autonomy from Constantinople, the fortuitous island setting gave other advantages over the following centuries. The sheltered position on the Adriatic Sea between the northern and western cultures of Europe and the southern and eastern cultures of the Middle East and the Islamic world, placed the site at the heart of the international trade routes. Venice rapidly grew from a fishing community into a burgeoning trading centre, as commercial buildings and shipping docks were built. And in time, Venice developed not merely as a city, but as a 'city state' whose boundaries would extend beyond the lagoon to embrace settlements along the Dalmatian Coast, and mainland towns such as Verona and Padua. In so doing, Venice was securing its borders and trade routes both by sea and on land. In 1082 full independence from the Byzantine Empire was finally achieved, and soon Venice was profiting still further from the first of a series of crusades against the Muslims in the Middle East, refitting ships and acting as a stop over for knights on their way to battle. Venice flourished. The Doge was gradually reduced to a figurehead position as a carefully selected council took control of affairs, and almost every aspect of their administration was geared towards profit. Relative freedom from papal interference, a combination of sometimes shrewd and sometimes underhand trade negotiations, and successful military campaigns against other city states like Genoa meant that by the mid 15th century Venice had reached a zenith of trading and military power - the richest, most powerful city in all of Europe, with 36,000 sailors operating 3,300 ships, and territories as far afield as Crete and Cyprus, and across much of northern Italy. Yet even as Venice was reaching its zenith of international power, the seeds of its eventual decline were being sown. In the early 15th century the rise of the Ottoman Turkish Empire as a rival power led to conflict, and ultimately Venice lost control of much of its eastern territory to the Ottomans. With this, went some of Venice's eastern trade. Then the discovery of America and the establishment of trade routes to the east around the South African Cape meant that much power shifted to the new western empires of Spain and Portugal and later Britain, and their ocean going ships. 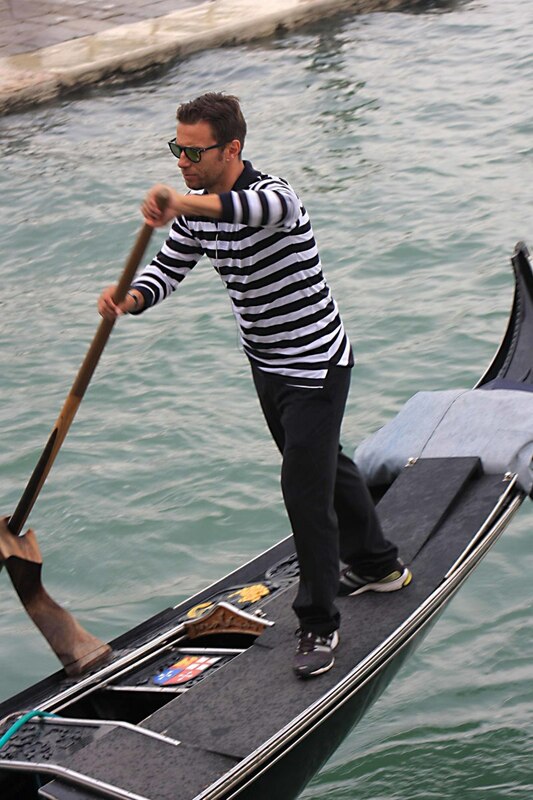 Venice's traditional oared galleys - fine for the Mediterranean - were no longer state of the art. 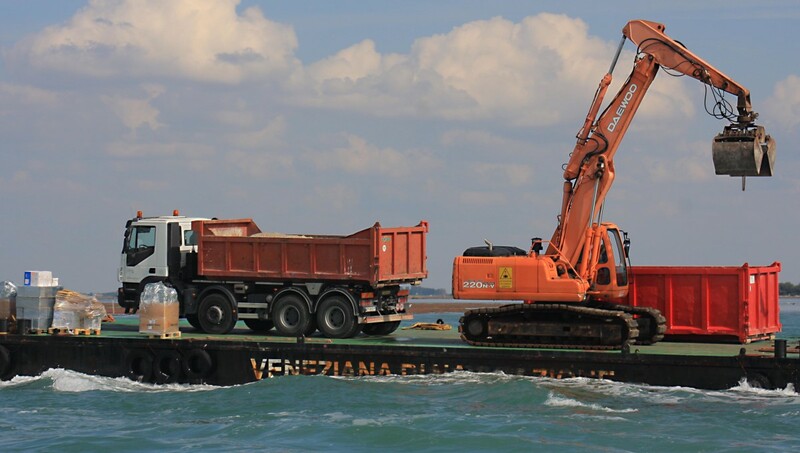 And even within the Venetian mainland, problems were building. Rome increasingly regarded Venice's power as a serious threat to papal authority, and other city states such as Milan and Naples united to challenge Venice. In 1509 many of its mainland terrritories were finally lost, though the historic city survived intact. Over the next few centuries, Venice gradually lost all international power, yet within its own city borders remained vibrant and entered a new phase in its history. In the 16th century, Venice was at the forefront of architectural design, and leading families vied with each other to build the grandest palaces. The city led the world in other industrial fields too such as printing and glass manufacture. And with the loss of power, Venice found new prestige as a centre of the arts and culture. Musicians such as Monteverdi and Vivaldi, and artists such as Canaletto, made Venice their home. It developed a reputation as the most elegant and refined city in the world. And the city's most infamous resident, Casanova, became almost synonymous in perpetuity (perhaps to the chagrin of Venetian officials) with the flamboyant lifestyle the city was now developing. In 1797 Venice finally lost its independence, when the city fell to Napoleon's armies. Then after the French Emperor's downfall, the expansive Austrian Empire assumed control of the city over the next few decades. In the 1850s Venice was once again free from foreign interference, but aspirations of reinstated independence were short lived. In 1866, a new united Kingdom of Italy was finally established, and Venice was incorporated into it. Since then, Venice's fortunes have been mixed. 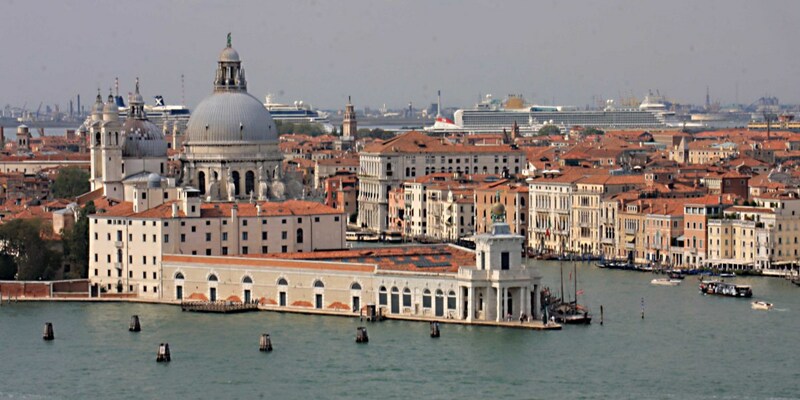 A conurbation has developed on the mainland, but the historic island city has suffered in the 20th century, from a declining population, from pollution, and from a gradual sinking of the foundations into the Venice lagoon, and consequent severe problems with flooding. Vast sums of money are today required for Italy to maintain the old city. But maintain it they must, because Venice's unique history has made it arguably the world's most beautiful city and one of the world's most attractive tourist destinations for visitors from around the world. So what makes Venice unique. Why are there so many canals and no roads? Venice is not built on solid land. This entire area was never solid ground but rather marshy muddy mounds in the lagoon. And Venice was not built on just a single mound or island, but on 117 islands. Wood pilings driven deep into the clay below support layers of stone and wooden planks, and buildings were constructed on top of this foundation. It may seem to be a very insubtantial foundation but vast numbers of local trees on the once forested mainland provided the wood - 12,000 trunks were used just for the Rialto Bridge and the Campanile Bell Tower is said to rest on 100,000 posts. Space being at a premium, footpaths between the buildings were narrow, and transport has always been by the much easier option of canals - largely natural waterways between the islands, but excavated as necessary to make them navigable. In total there are about 25 miles of waterways and 177 separate canals within the city. Today the old city is reputed to be the largest car-free urban area in Europe and it is the only entirely car-free city in the world. Today of course the lagoon and the canals which made Venice such a rich and powerful state in centuries gone by, remain the veins and arteries of the city, the water its lifeblood. They are the way for all to get around. And indeed on the island of the old city itself there are no cars - just canals and narrow streets. So bearing that in mind, for anyone contemplating a short visit to Venice, it is important to get transport and accommodation arrangements right. One can stay on the mainland and travel to Venice each day, or one can stay on an outlying islands or the Venice Lido - a sandbar stretch of hotels and beaches. If spending more than a few days in the area, then a mainland location may be preferred for the advantage of car hire to travel further afield. And these options may be cheaper and less crowded than staying in the historic city itself. But of course these options are less convenient for those who only have a day or two in Venice and who want to really experience the fuill flavour of this amazing city both day and night. For those people, staying in the old city is the solution. In Venice itself, hotel prices are generally high, so bed and breakfast or rental accommodation may be preferred by some. If staying full or half board, hotels of comparable standard will unsurprisingly be cheaper the further one moves from the main attractions of St Marks Square or the Grand Canal, though equally of course these hotels are less accessible on an island without automobiles. Space is at a premium here, so most hotels are small and may be more spartan than many tourists would expect. But that's not so bad if one is only staying for a few days - hotels in Venice after all are not a holiday experience in their own right - they are only a base from which to explore the city. 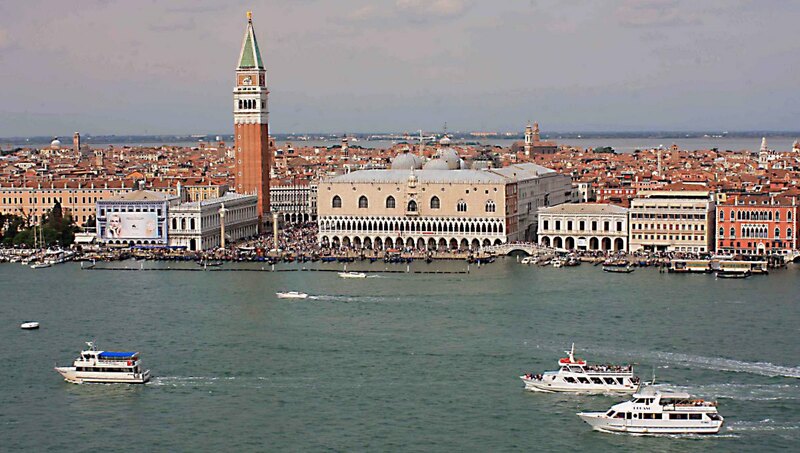 Some who visit Venice will arrive by cruise ship, but those will have their own travel and accommodation arrangements. Most however, will come by air. Those who travel this way may arrive at Treviso Airport to the north, from which a land transfer to Venice will be required. More commonly, tourists will arrive at Marco Polo Airport. Some will have bus or train transfers to their destination. And there are of course taxi cabs too. 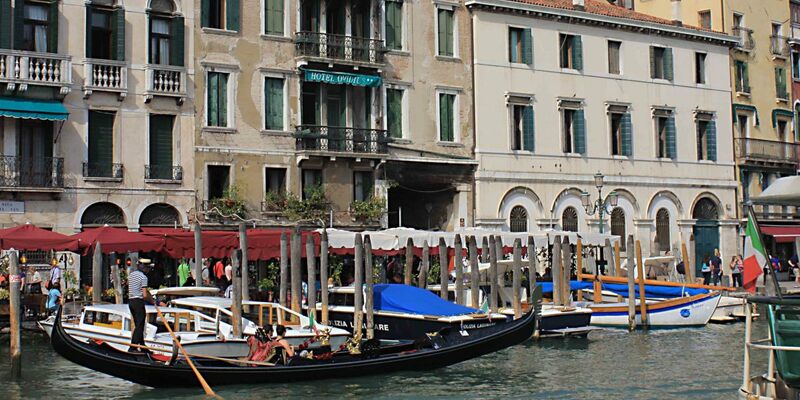 All these are fine if your chosen accommodation is on the mainland, but if you are staying on the island of Venice, or anywhere else in the lagoon, then it is important to bear in mind that the only transport on the islands is by boat. Today, one can actually get to the old city from the airport by train or car - a rail link across the lagoon was constructed in 1846, and a road link was added in 1933. But both the road and rail connections terminate soon after arrival in the north east of the historic city. From there on, all travel - including finding your way to your hotel - will be on foot or by boat. Therefore, it will be useful (particularly if arriving at night) to know exactly how to find your accommodation in Venice. For most who come by air, the more convenient way to get close to your island accommodation is by boat. The boat piers are just a short walking distance from the airport terminals, and are signposted, though it may be as well to learn the system before travelling in order to avoid delays on arrival. Boat tickets can be bought on online, at the airport or at the piers. Two options exist - private water taxis can be hired to take you direct to your destination, though these are extremely expensive. The Alilaguna water bus is the better bet for most of us. There are several Alilaguna routes which stop at various stations around Venice and these are distinguished by colour (eg: the Blue Line, Orange Line etc). Ensure the correct water bus is caught, to save delays or a long walk to your hotel. 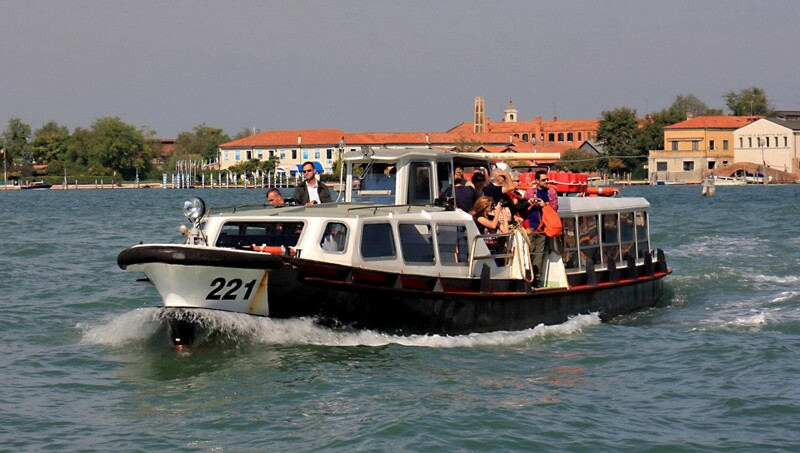 Once in the island City of Venice, the most practical water-borne transport is the vaporetto water bus. Vaporetti (plural) provide a frequent and regular service along the Grand Canal of Venice, and between the islands of the lagoon. And in Venice you are never too far away from a vaporetto station. A three day pass is economical and very convenient, and can be bought at any of the manned ticket offices around Venice. Once you've paid, it can be used almost like a free pass - just hop on and hop off at different water bus stations whenever you please and wherever something catches your interest. What is Venice most famous for? Not any single piece of architecture, but rather the canals which criss cross the city and the distinctive long black boats which ferry tourists along those canals. These are the gondolas. Today most locals use the city's water buses (vaporetti) or their own private boats for transport, and the gondolas are predominantly the preserve of the tourist trade. But it hasn't always been that way. About 400 gondolas are now to be found in Venice, but 300 years ago, there were as many as 10,000. They were the staple means of getting around the waterways, the long thin gondola shapes perfect for negotiating the narrower canals. 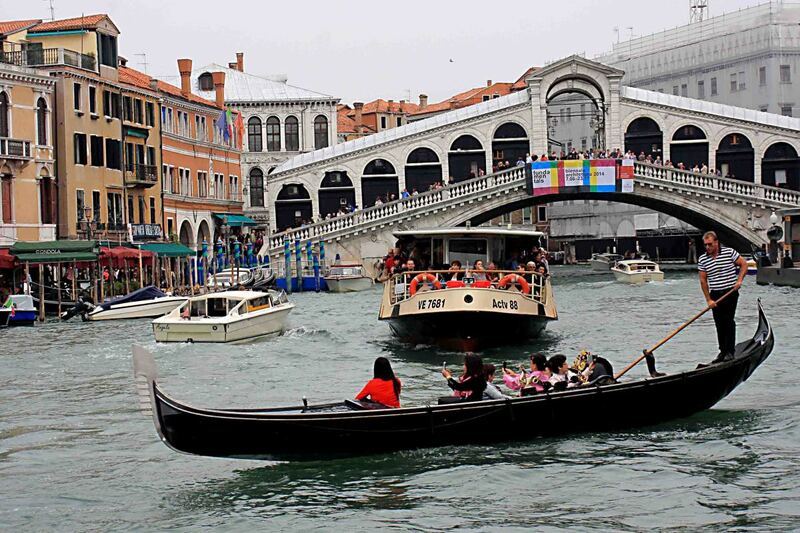 Gondolas adhere to strict regulations regarding their size and appearance; all are about 10.7 metres in length, and all are black in colour. 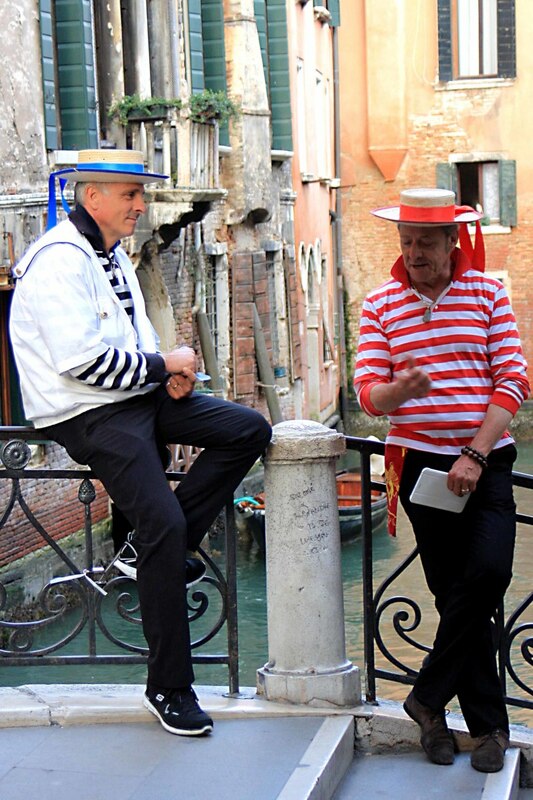 The gondoliers also wear traditional uniforms - blue and white or red and white striped T-shirts with straw boater hats to match. Should one opt for a gondola ride? 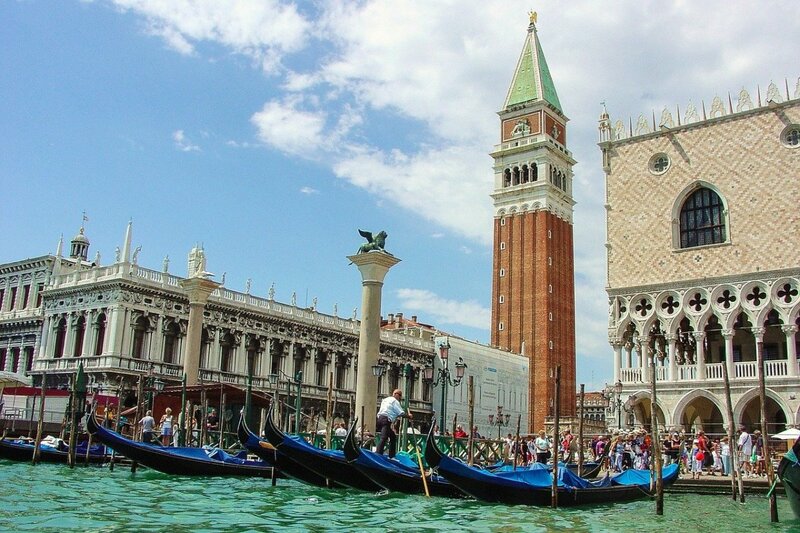 Many reviewers dismiss the gondolas in Venice, stating that they are too expensive. They are very expensive. But a gondola ride is the thing you are supposed to do in this city, and for many, the Venice experience just wouldn't be complete without a ride in one of the long black boats. Perhaps these days the gondola ride is not quite as romantic as it once was, with thousands of tourists eyeing you as you float serenly past. Not all of the gondoliers wear the straw boaters for which they are famous, and I only saw one serenaded party, and even then it wasn't the gondolier who was doing the serenading, but an entertainer. Nonetheless his voice was good, and he brought a smile to everyone who watched as that particular gondola passed by. I would say that for general transportation, the vaporetto is quicker and cheaper, and walking the streets is a more interesting and much cheaper option. But for those on a romantic break who can afford it, a gondola ride is a must-do activity in Venice, never to be forgotten. You'll probably regret it if you don't experience it on a once in a lifetime trip. Whatever method of water transport around Venice one opts for, the Grand Canal is certain to feature high on the itinerary. Most of Venice's canals are narrow little waterways barely wide enough for two gondolas to pass each other, but the Grand Canal is different. 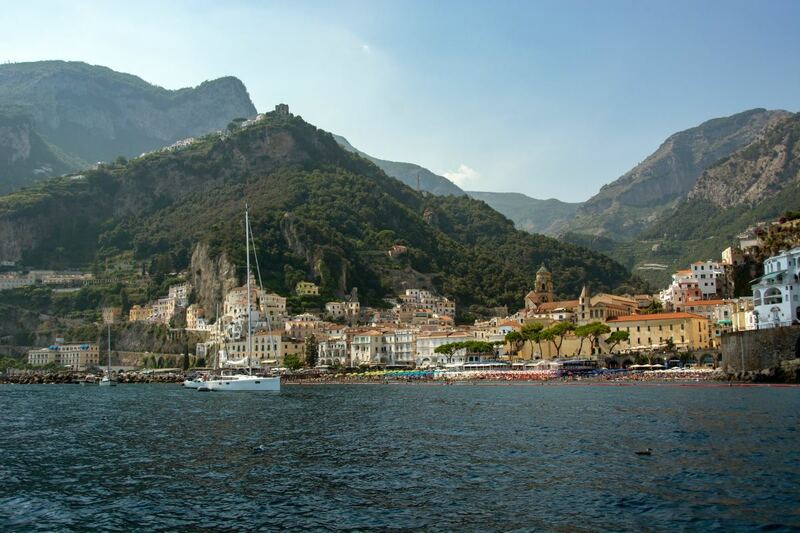 4 kilometres long, and up to 90 metres wide, this is the main artery of the city, ferrying cargo and passengers on an assortment of boat types from the car parks and the railway terminus in the north west to St Marks Square in the southeast. And lining the canal are nearly 200 of the most ornate, historic and best preserved medieval and renaissance buildings anywhere on Earth. 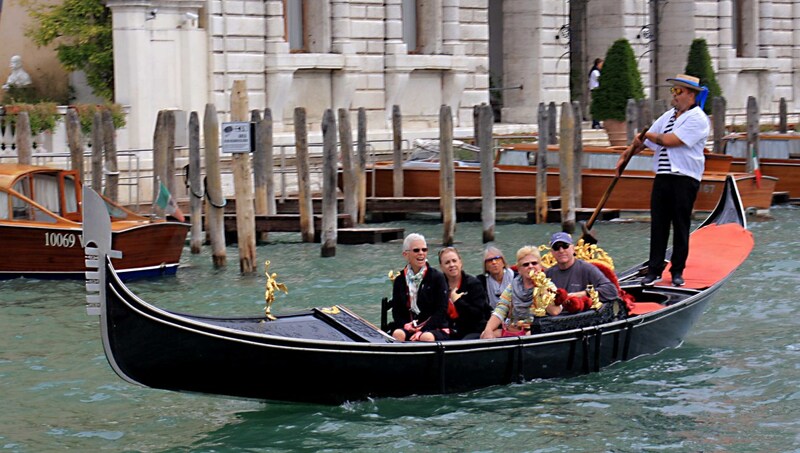 Cruising down the Grand Canal is a must-do experience for any visitor to Venice and the sights to be seen here are featured in another article in this series. If you have a city built on 117 islands, then the most important architectural constructions are bridges There are more than 400 bridges in the old city, providing crossing points over the network of canals. Most bridges are small and relatively obscure, but all are picturesque and all have seen a lot of history. 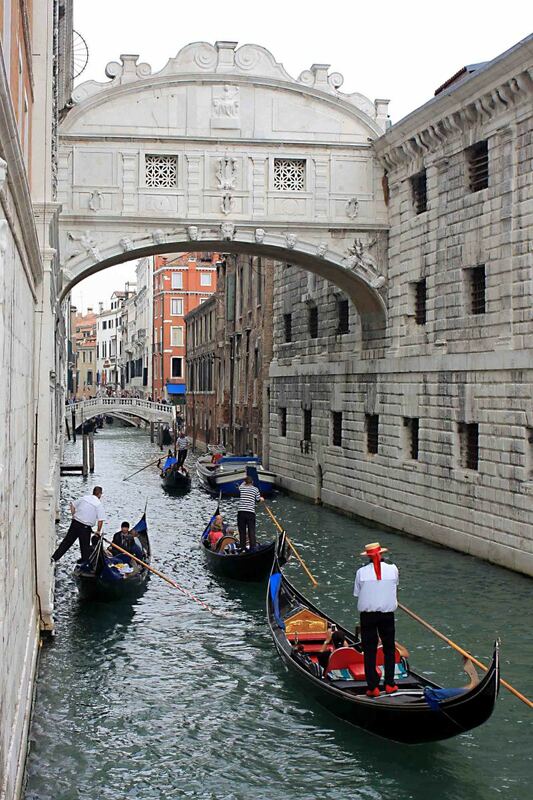 Usually they are of brick or stone structure, and arched to allow gondolas to pass underneath. 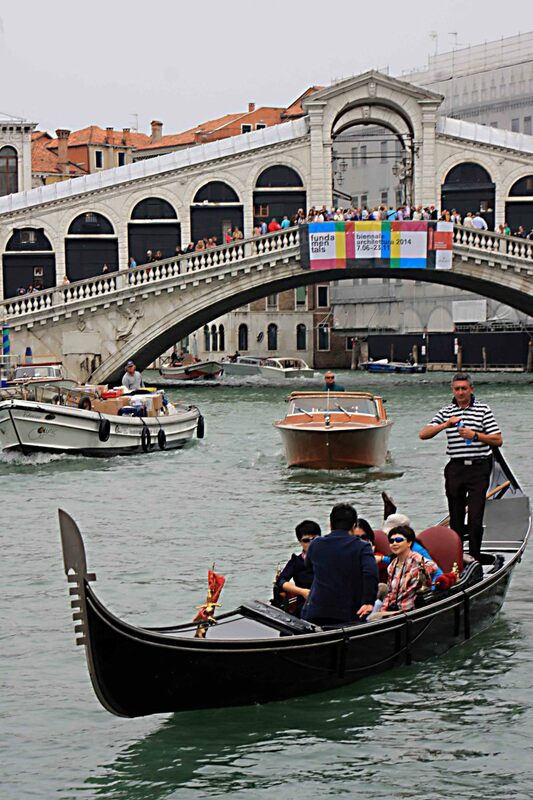 Only four bridges traverse the wide expanse of the Grand Canal, and only one of these dates to before the 19th century. The Rialto Bridge was built between 1588 and 1591 and is the most famous and celebrated of all Venice's bridges. The ornate design makes the Rialto Bridge one of the iconic sights of Venice. Of all the bridges over the lesser canals, The Bridge of Sighs has almost legendary status. Built in 1614, it once connected law courts on one side with prison cells on the other. Its real name is Ponte dei Sospiri, but it was given its English epithet by Lord Byron, who imagined the sighs as prisoners made their way to the cells after learning of their fate in the courts. There are actually two piazzas or plazas here. The Piazza San Marco is set a little back from the shoreline, surrounded by colonnaded buildings and fronted by the Basilica. The Campanile also stands here. Between the Piazza San Marco and the shoreline is a smaller square called the Piazzetta San Marco, which is bordered on one side by the Doge's Palace and on the other by a complex of museums and libraries. In practice, the Piazza and the Piazzetta merge into each other to form one of the largest open spaces in Venice. The Grand Canal opens out into the Venice Lagoon close to the site of the greatest architectural attractions in the city of Venice - St Mark's Square. Even though there are interesting sights and buildings of great historic interest almost everywhere in the city, undoubtedly the focal point for most tourists is St Mark's. Vaporetto stops near the Square are the busiest arrival and departure points on the island, and mega-sized cruise ships harbour nearby to disgorge the day trippers in their thousands. 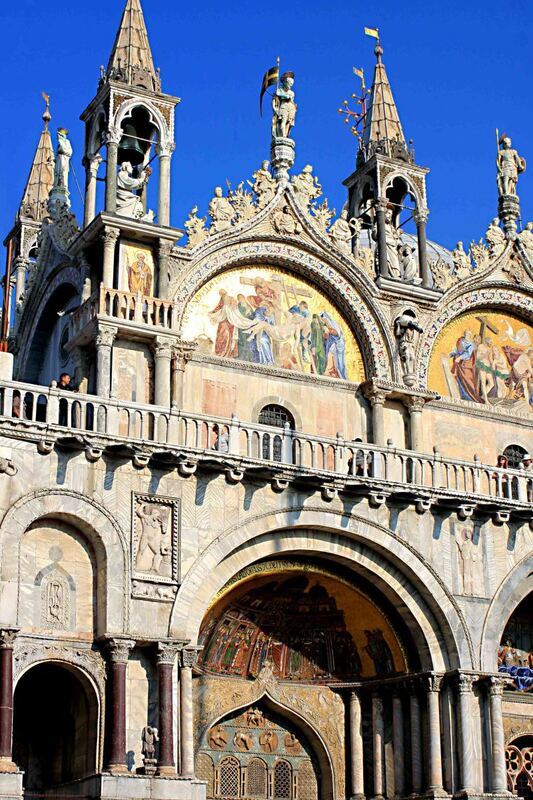 St Marks is the site of three major attractions, the Doge's Palace, the Campanile or bell tower and the Basilica. 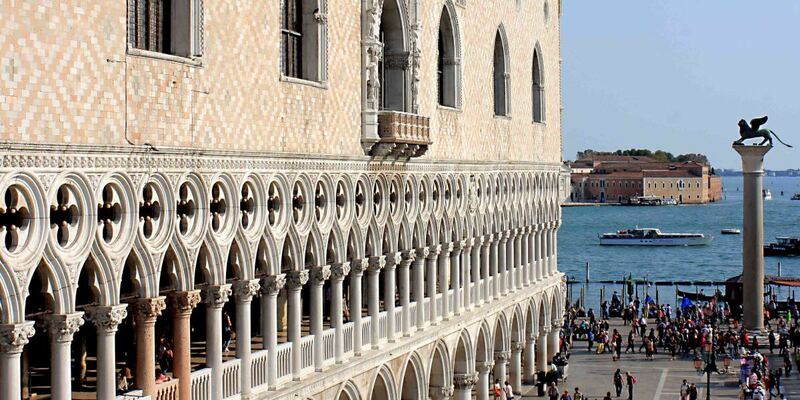 The Palazzo Ducale or Doge's Palace is the first of these buildings to be reached if one arrives at St Mark's from the sea. As the name suggests, this was home to the Doge of Venice for many centuries, but also to the political Council of Venice. The current building replaced an earlier one, and largely dates to the late 15th century, though extensive refurbishments have occurred since then. An entrance fee and a tour will take one around many of the glitteringly decorated palace rooms including the Great Hall, where the council once convened. In addition to paintings of 76 Doges, the Hall also includes Tintoretto's 'Paradiso', which is reputed to be the largest classical oil painting in the world. Tours also take in the old law courts once housed here, and entrance to the Doge's Palace is the only way one can get to walk through the famous Bridge of Sighs. The Campanile or bell tower, also replaces an earlier structure which sadly collapsed on 14th July 1902. However the new tower which in appearance is an exact replica, was constructed, the building completed on 25th April 1912. 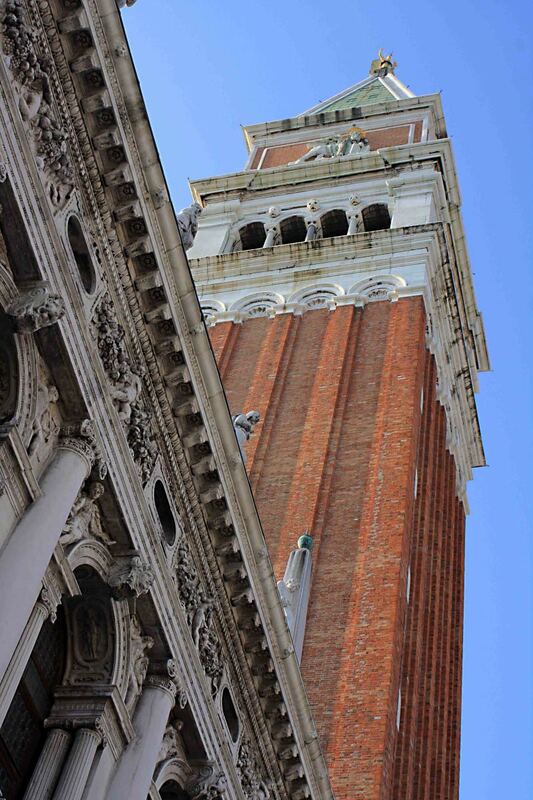 At 100 m (330 ft) the Campanile is the tallest building in Venice, and an entry fee allows one to take an elevator to the top for the best views of St Mark's. A detail from the Palo d'Or which contains 1,927 precious jewels including pearls, sapphires, rubies and emeralds. Of all the great buildings of Venice, none is more reverred than St Mark's Basilica. The original building dates from c832 AD, but this largely wooden structure was lost in a fire, and its replacement was built between 1063 and 1094. That is the church, with some modifications, which graces St Mark's Square today. The reason for the conception of the original Basilica was as a tomb for the remains of the evangelist and patron saint of Venice, St Mark. By legend his bones had been smuggled out of Alexandria in 828 AD and brought to Venice by two merchants (hidden in a consignment of pork to discourage Muslim officials from searching it). 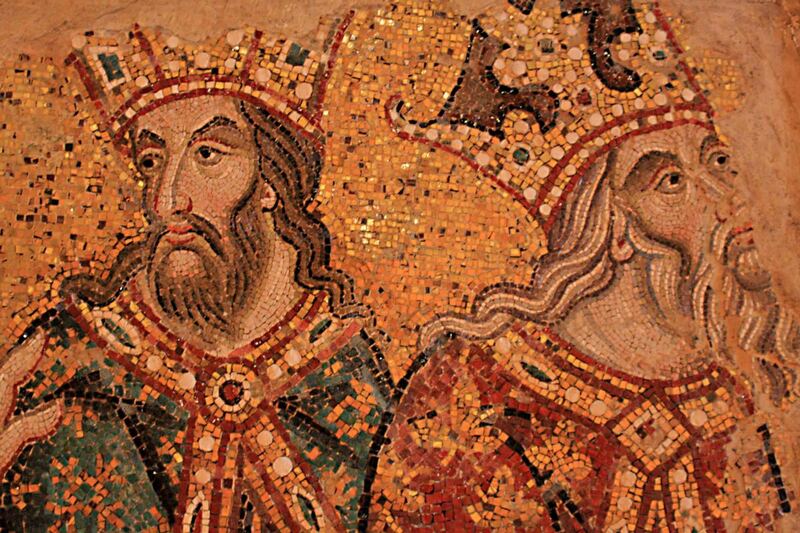 As the new Basilica arose in the 11th century, the significance of the new church could not be overstated. Aside from providing a tomb for one of the four writers of the gospels (in itself a matter of great importance to the city), there was perhaps symbolic value in the design of the church, because the Byzantine architecture of the facade (and the treasures inside) are Venice's most obvious link to the Empire which had once ruled it, and a statement of Venice's greatness as a successor to the power of Constantinople. For a long time the Basilica acted as the Doge's private chapel, but today it is recognised as the cathedral of Venice. I cannot go into details in this short piece, but the exterior of the Basilica is a sumptuous extravagance of five great arches and five domes, ornate spires and columns, and adorned with rich mosaic images, some dating to the 11th century, others added over the next three centuries of Venetian power. And the interior is likewise spectacular, with gold leaf mosaics on the floors, the walls and ceilings, and festooned with treasures variously traded, or frankly looted, most notably during the fourth crusade of 1204, when Constantinople was ransacked to the benefit of Venice. As a church, most of the Basilica is free to enter, but there are exhibits which one must pay to see. 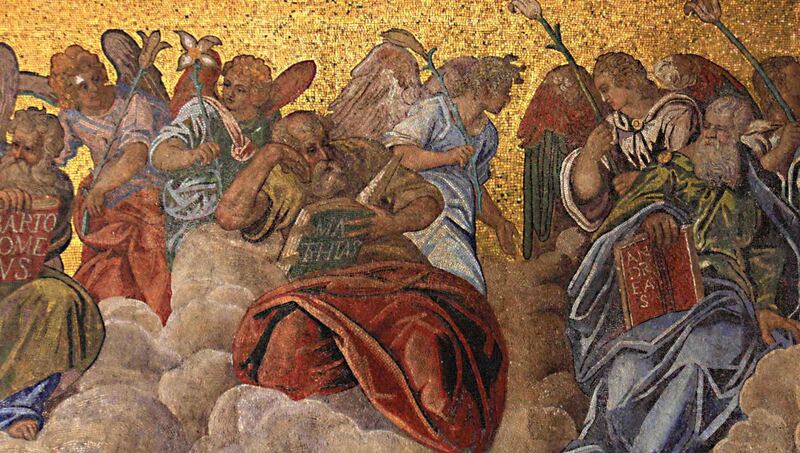 These include the Pala d'Oro and the Treasury and Museo di San Marco. The Pala d'Oro is a fabulously gaudy gold leaf and jewel encrusted altar piece with Biblical scenes, first created in the 10th century in Constantinople and expanded to its current form by 1345, and now installed behind the altar. Museo di San Marco - the museum - can be found at the top of a flight of stairs to the right of the entrance, and it is worth a visit. The elevated position allows good views over the church's interior and the Piazza below, as well as having many historic items on display. 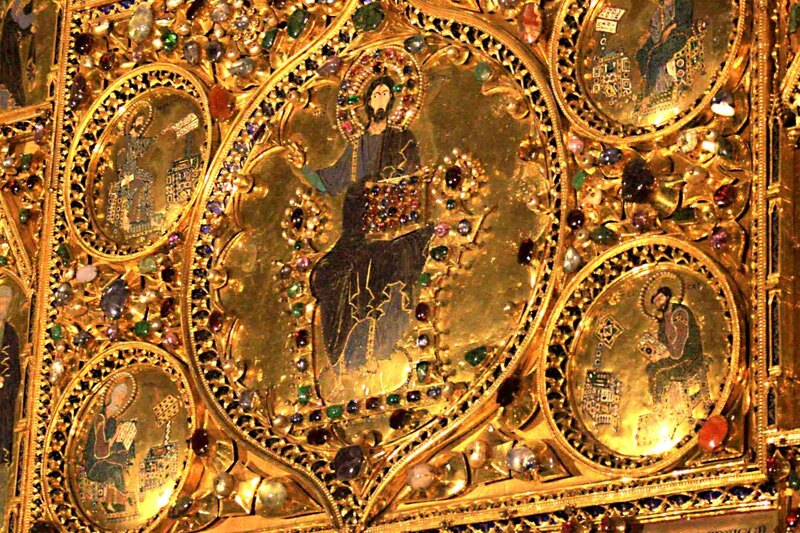 The most treasured is the Cavalli di San Marco, brought from Constantinople in 1204. 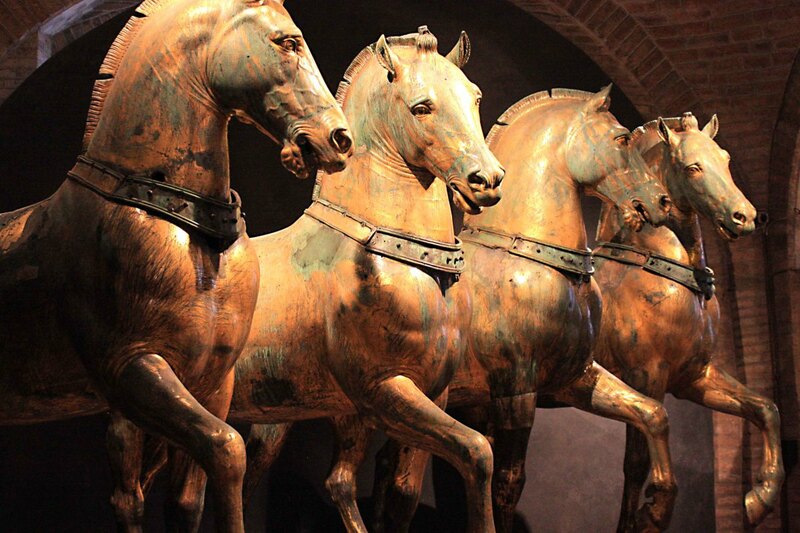 This is a unique example of an ancient quadriga (four horses abreast, as used in chariot racing). The statue is thought to date to about 200 AD, and may once have been set at the top of Trajan's Arch in Rome. Long queues can form to enter the Basilica (and other buildings in the Square), and a nominal charge can be paid online to jump these queues, but usually the queue moves quickly and the wait to enter is not usually as long as one might imagine. One could easily spend a day just in the vicinity of St Marks, because it is not just the three buildings described above which draw the crowds. The Square is surrounded by other historic buildings and monuments, each with their own tale to tell. And there are more modern attractions too. 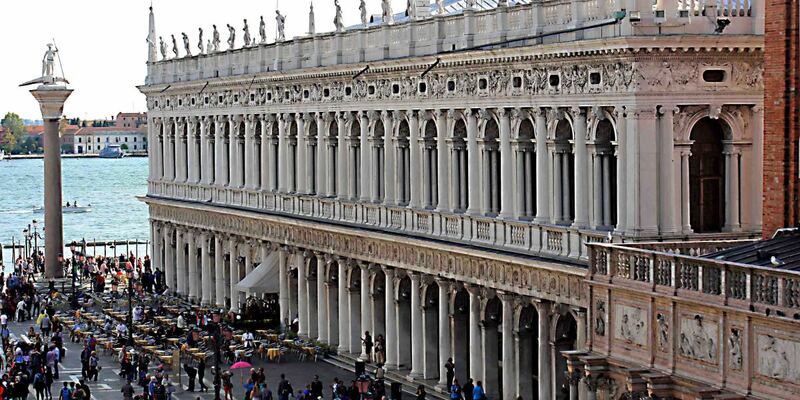 Even when arriving at the Square as many do from the vaporetto stops of San Marco or San Zaccharia, before entering past the Doge's Palace into the Piazetta San Marco, visitors will pass between two tall columns often without giving them a second glance. But these two columns are worthy of note. The date of erection is uncertain but they have been in place at least siince the 13th century. And they act as pedestals for two very different statues. One is a composite sculpture of St Theodore, former patron saint of Venice, with a crocodile - representing a dragon he is said to have slain. This can be seen in the photo below. 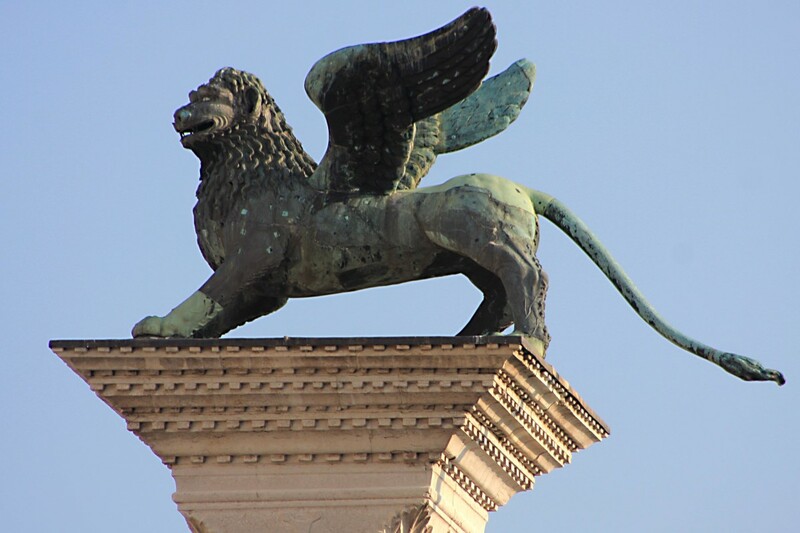 The other column displays a very ancient winged lion - a symbol of St Mark, who replaced St Theodore as patron saint - but this statue is believed to date to the 3rd-4th century BC, and originally stood at Tarsus in southern Turkey. And the columns hold one other, slightly gruesome, fascination. Between these columns public executions once took place. 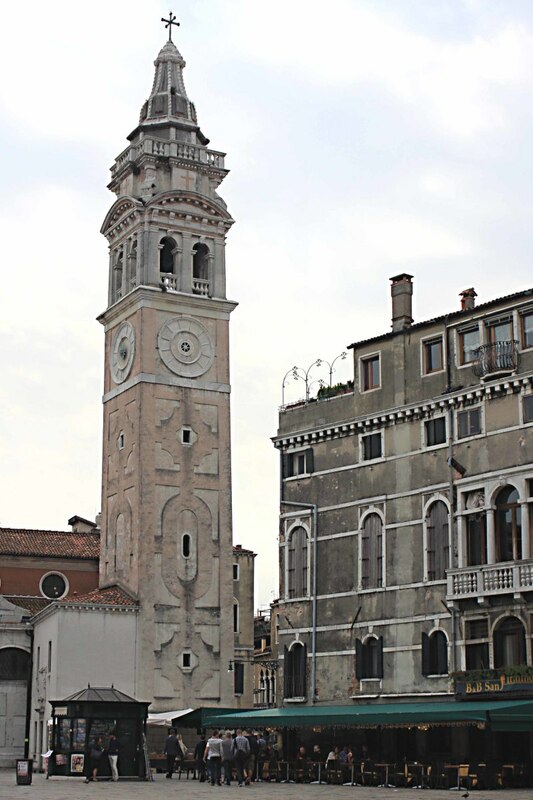 When standing in the Piazza San Marco, all eyes will be on the Basilica, but look to the left and a most unusual clock dominates one of the buildings.The building is the Torre dell' Orologio or Clock Tower. It dates to the end of the 15th century, and the bell and much of the facade including the clock face are original. The clock features both Roman and Arabic numerals and also Zodiacal signs, and remarkably on this ancient tower there is also a digital time display - Roman numerals spell out the time, changing in 5 minute intervals. The archway underneath opens into the Mercerie, a main street of the city which leads to the Rialto Bridge. But most Venice aficionados agree that looking at the buildings in St Mark's and then leaving, is not good enough. The thing to do here is stay a while to just soak up the atmosphere, perhaps to attend one of the concerts occaisionally held in the Square (featuring world famous names) or sit in one of the open air restaurants (if the price warning mentioned earlier does not deter), listening to the musicians and watching the people go by and the flocks of pigeons fly by. 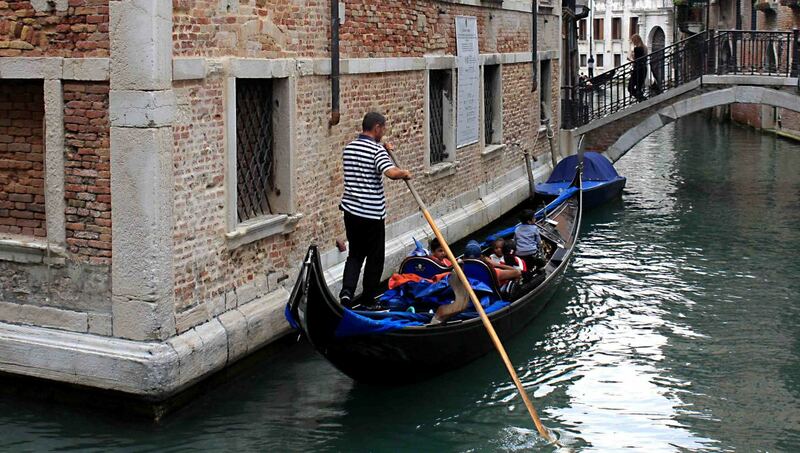 Many tourists will cruise along the Grand Canal and visit the attractions of St Mark's. That's it. 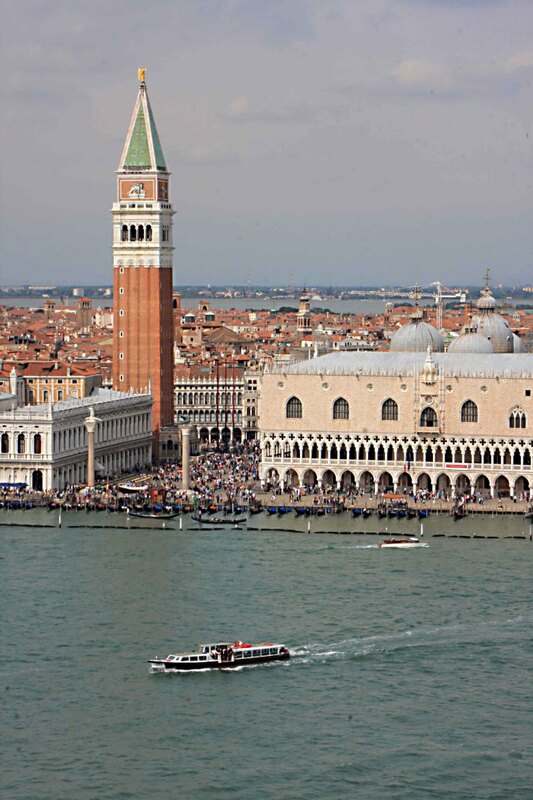 But Venice is much more than this and there are historic and cultural sights worth seeing throughout the city. Churches in particular are unsurprisingly well represented, and many have a history and a state of preservation which would make them a national treasure in any other country. And Venice's long history as a cultural centre means that there is much more to see than just physical bricks and mortar. Theatres and opera houses such as the Teatro La Fenice remain as world class venues for high culture, and art galleries like the Accademia (classical art) and Peggy Guggenheim Collection (modern art) are among the most popular attractions in the city. And when one is done with viewing the historic buiildings and Venetian culture, then there are always local people going about their business, in some cases plying the same trades as they have done for centuries - market traders, street entertainers, gondoliers and the like. All can offer interesting viewing and great photos. If there is one time of the year when Venice comes into its own, and high culture and common people unite, then it must be Carnival time. 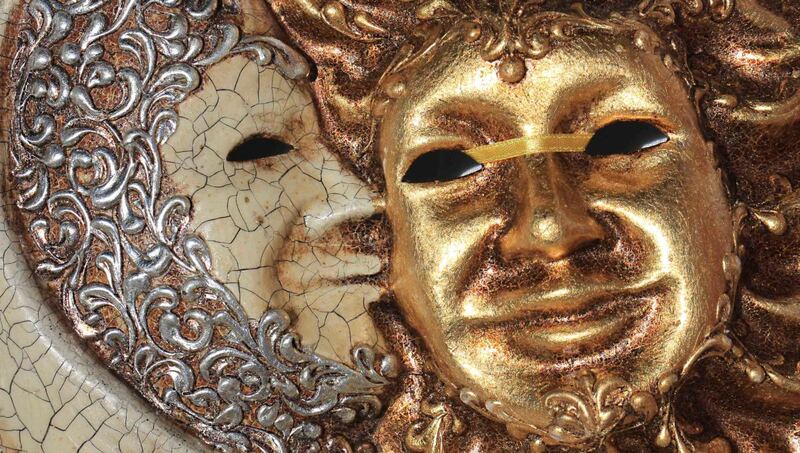 Venice is synonymous with carnival, and the many concerts, masquerade balls and processions associated with it. I have not experienced these events, but all accounts suggest that this is the time to be in Venice, when its history really comes alive and the people re-enact age-old festivities. Go there in carnival season if you can, but really at all times of the year and whatever one's interests, there are sights to be seen throughout Venice. 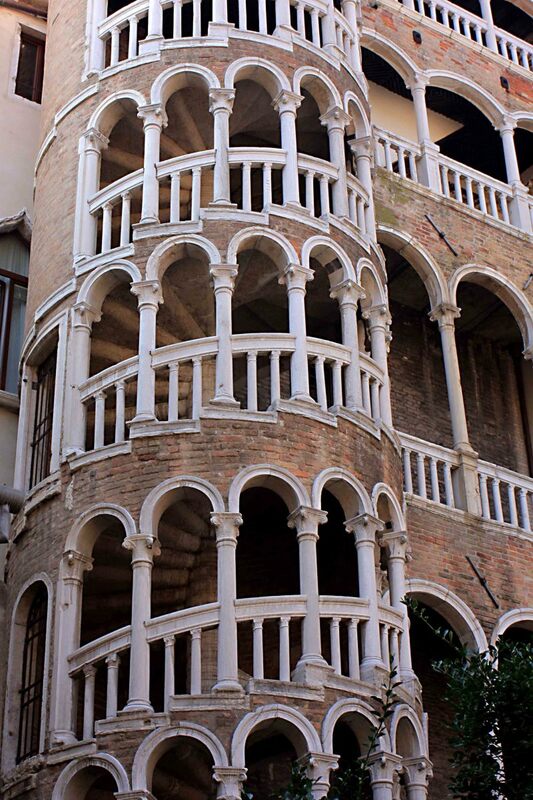 Perhaps Venice's best concealed architectural wonder is hidden away in a tiny little courtyard not far from San Marco. It is the spiral staircase of Scala del Bovolo. This will pass many tourists by, either because they're not aware of it, or because they just can't find it and give up, thinking it's not worth the effort. It IS worth the effort. The small square of Campo Manin can be found on most reasonably detailed maps of Venice. Once there you have to look carefully around the walls of the square. On one of them is a very small sign with the name of the 'Scala' and an arrow pointing down a short narrow street. A couple of twists and turns from there and another sign brings you to the staircase courtyard. It's not easy to get photos because the courtyard is tiny, while the staircase is tall with five ornate spirals and an upper platform, but it's a beautiful 500 year old building well worth seeking out. So far we have concentrated on the big and the spectacular. But there is much more to Venice than luxurious palaces and churches, and the Grand Canal, and all the galleries, theatres and museums. So what lies away from the main tourist attractions? Land space is at a premium in Venice, so there's no space for wide avenues. Who needs them anyway without any cars? What's more, the streets have never provided the main entrance into buildings which front on to the canals; the streets effectively are just a space between houses and a way of getting from one canal to another. 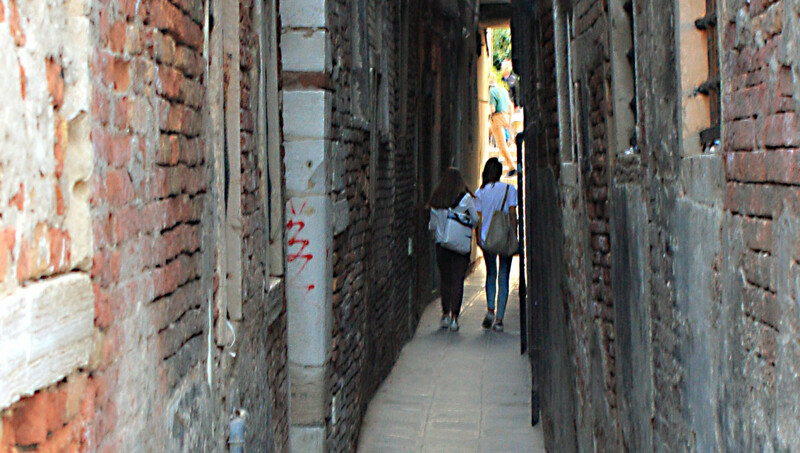 As a result some of the streets in Venice are quite extraordinarily narrow. The narrowest of all is called Calle Varisco at just 52 cm (20 inches) wide. I never found that, but the pathway shown below is sufficiently narrow that two reasonable sized people cannot pass without getting quite intimate! Likewise, when it comes to waterways the Grand Canal is the exception, not the rule. There are 177 canals in Venice, and there is only one like the Grand Canal. All the rest are more like the little creek featured here. No vaporetti pass down these canals, just gondolas and small boats which serve the local people who live here, and the businesses they run. Take away the two motor boats from the photo of the canal above, and this could be a scene from the 16th century. Some reviewers say get a good map to avoid getting lost in Venice. Others say that the very best thing you can possibly do is get lost in Venice! I think that unless on a very tight time schedule, I would be in this second camp. Wandering aimlessly round the narrow streets and over canal bridges so low the gondoliers have to stoop, leads one to discover unexpected little gems of cafes, bars and shops. The book store on Calle Longa Santa Maria Formosa is one such hidden gem. 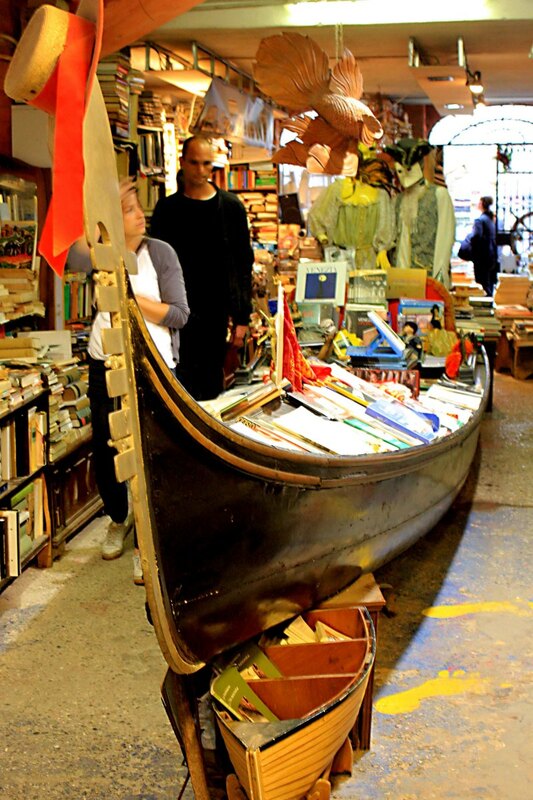 Regularly appearing on Internet lists of the most interesting / beautiful / unique book shops in the world, the Libreria Acqua Alta features books stuffed into gondolas, books stuffed into a bathtub, and books just piled on top of each other, frequently with one of many household cats perched on top! There's even a staircase made up of stacked books. And the rear exit to the store, of course, backs on to a canal. It is certainly one of the more unusual retail outlets of the world! In truth, many of the tiny streets in Venice are not labelled on most maps and so one can easily 'get lost' in the sense of not knowing where one is, but there are regular big yellow signs with arrows guiding towards San Marco or Rialto, and in the various districts there are also signs leading to the main vaporetto stations and piazzas. And on a small island, its not like you're going to be lost for very long! It really is the best thing to do in Venice to get a real feel for the place away from the hordes of tourists. Venice is geared up to receiving tourists from all over the world, so there's no difficulty finding places to eat. 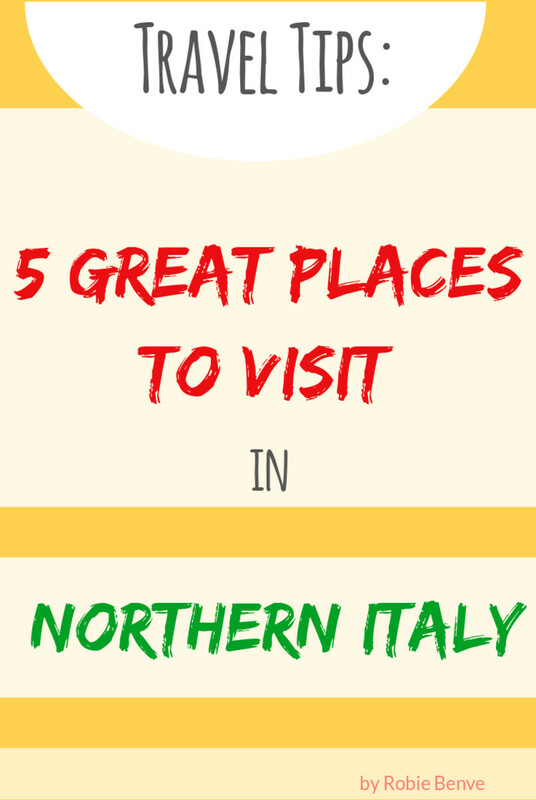 Most restaurants are unsurprisingly Italian, and other international cuisines are not so well catered for - though of course good quality hotels cater for all tastes. Many will want to eat in the romantic settings of St Marks Square, and along the banks of the Grand Canal, but Venice isn't cheap, and one tip would be to move a few streets back from the main tourist sites where prices may be less. And one great idea to try are the bacaros. These are small bars dotted around the city. One of the services they often provide are cicchetti - the Italian version of tapas - small dishes of finger foods such as calamari, olives, cheese, meatballs, potato, shrimp, salami etc, each costing just a few euros. 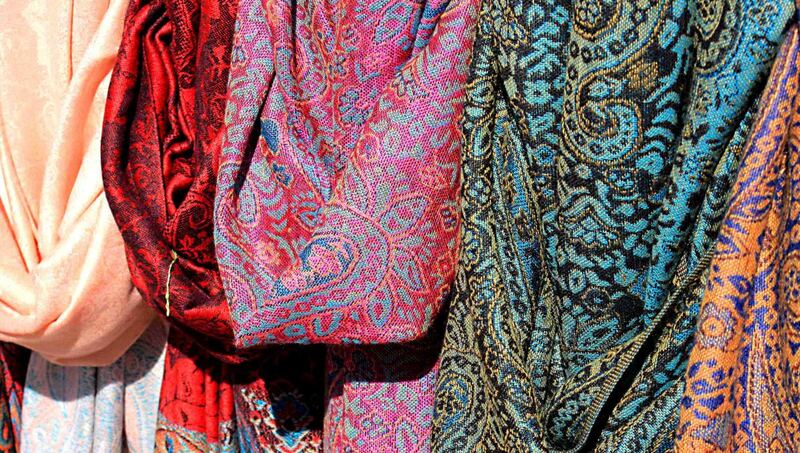 It's not necessary to get lost in order to shop in Venice, but wandering the back streets and canals will bring you to a wide range of retail outlets, some of which will be selling typical tourist trash, but others will offer traditional Venetian arts and crafts of genuine appeal. And the prices may well be much cheaper than in shops closer to St Mark's or the Rialto Bridge. And even if you don't want to buy, these shops are great for window shopping, and some have displays the like of which you'd not see in any other city. 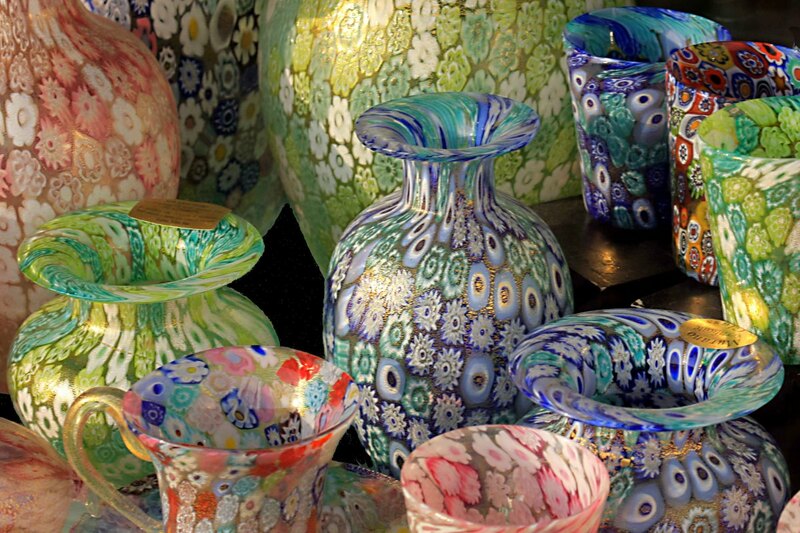 Traditional gifts and souvenirs include glassware from the nearby island of Murano and lacework from the island of Burano. However, as in most cities famous for traditional merchandise, beware of cheap imitations imported from elsewhere. Jewellery, leather and fashion are also popular. Possibly the most intriguing shops are those which sell carnival masks. 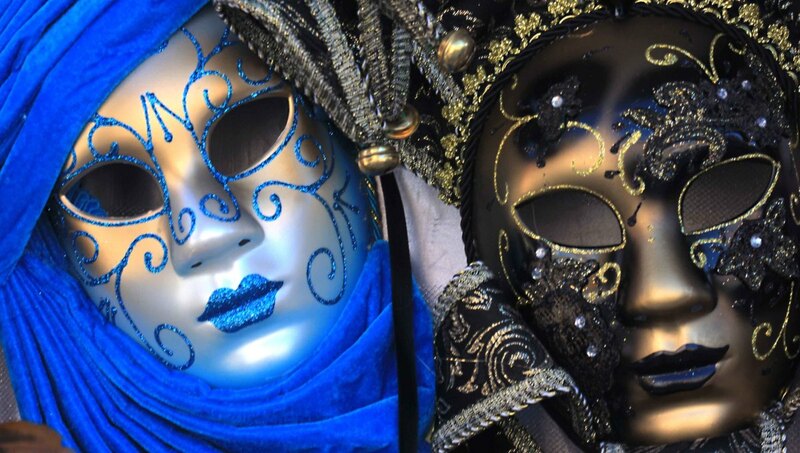 Although carnival is obviously seasonal, it is a major festival in Venice, and shops which are devoted to the festival and which sell the masquerade masks, are open all year round for the tourists, and are fascinating to wander around. This article is about Venice, but to get the most out of a visit to this region, one should also find time to spend a day cruising to one or two of the other islands in the Venice lagoon, some of which have a history at least as long as Venice's, and many of which offer a very different experience to enjoy. 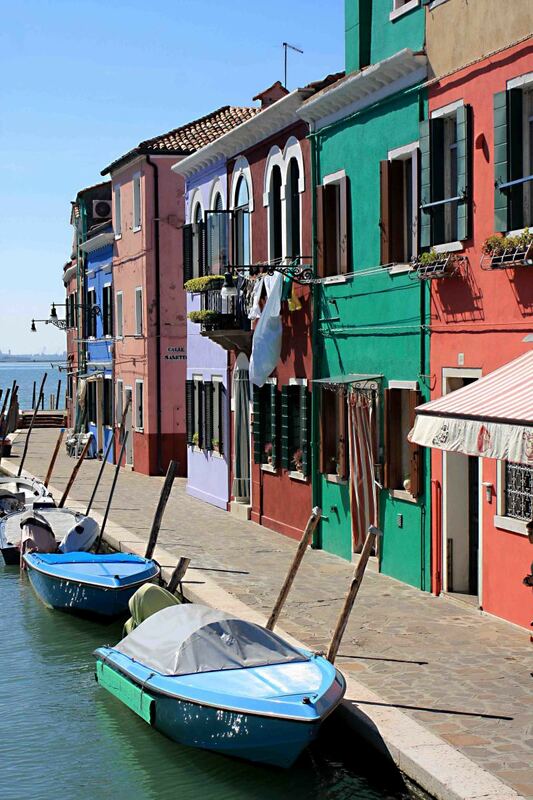 Murano, which is renouned for its glass blowing factories, and Burano, famous for picturesque, multicoloured cottages, are probably the two most popular destinations, but several other islands may also be worth a visit. These are featured in another article in this series, but a recommendation would be to allow time to travel further afield than the City of Venice itself. This page has only covered my first impressions of the city of Venice, gathered over two days walking the streets and riding the vaporetti. Nonetheless, first impressions do count when it comes to Venice. What you see is what you get. There's not a huge amount of nightlife to be discovered, be it seedy or exciting, there's no dark quarters where tourists shouldn't tread, no poor district or rich district or commercial shopping centre to seek out - instead there are canals and gondolas, historic buildings, culture, and tourist outlets. It actually doesn't take very long to get a feel for what Venice is all about, which is just as well as most will only spend a few days visiting here. In my introduction I described Venice as a candidate for 'Wonder of the World' status. I really do mean that. The fact that it is a city rather than an individual building, is not truly relevant - Petra and Machu Picchu are both 'cities', albeit ruined - and they were voted to be included among the recently updated list of Seven Wonders. 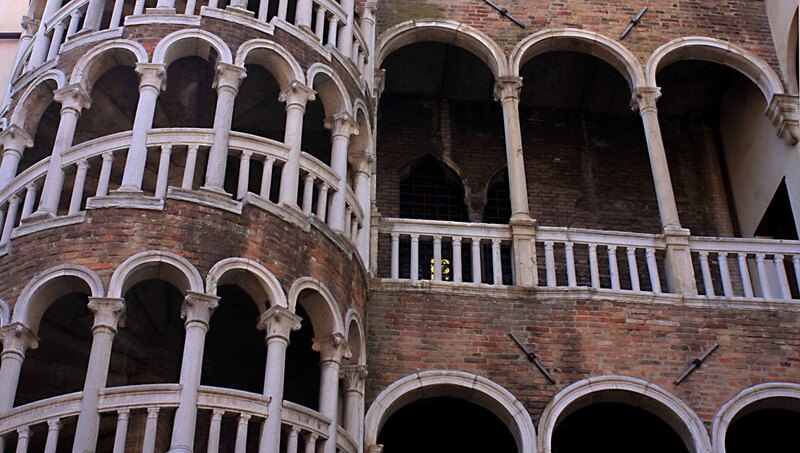 Venice is a miracle of medieval engineering. To construct the buildings of the city on islands of unstable ground, surrounded and infiltrated by sea water which laps at the very foundations, was a great technical feat at that time, and ever since Venice's heyday, those buildings have been under constant threat of subsidence and flooding, and remain so today. And yet they still stand, not one or two or even a few dozen, but thousands - 200 along the Grand Canal alone - almost all of which date to Medieval, Renaissance or pre-19th century times. They still stand relatively unchanged where the great majority of buildings of comparable age built on much firmer foundations in other cities have long since perished naturally or been demolished to make way for modern office blocks, hypermarkets and multi-story car parks. That is the reason I suggest that Venice is a wonder of the world. 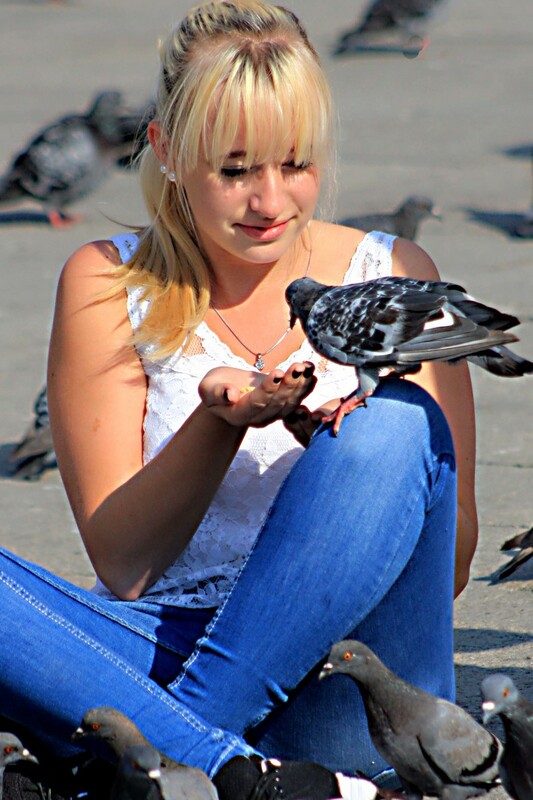 Whether you agree or disagree, it is surely a city to be visited by everyone with a feel for history and culture, and I hope that my page helps in some way to make a first time visit more fulfilling and more enjoyable. Visit the market by the Rialto. Most famous for its fish and fresh fruits and vegetables, the historic market is recommended for the quality of the produce and for the photo opportunities it presents. Take the 'Secret Itineraries' tour of the Doges Palace, enabling the visitor to see parts of the Palace off limits to the main tour. Arrive at St Mark's before 9.00 am to avoid the crowds. And stay for the evening. Many reviewers suggest that St Mark's is at its most serene and beautiful when the day trippers have gone. Visit the outer districts, notably the ghetto in the north. This is the original 'ghetto', once home to Venice's Jews, now possessed of a distinctive villagy feel, rather different from the main city. Venice isn't noticed for green spaces, but the Giardini Pubblici in the Castello District is a public park with gardens, and swings and climbing frames for children. And if greenery is in short supply, so are beaches. But the Venice Lido and the Lido di Jesolo are only a boat ride away (most of the beaches are owned by hotels, but some are free to use). Stephen Barnes; Thanks Stephen. It should be a great trip - the climate, the lifestyle, the scenery, and of course the history and architecture must make it one of the best countries in the world to visit. Great article. My wife and I are looking at taking a trip to Italy within the next year or so and had planned to spend a couple of days in Venice. The information you have provided here will certainly prove helpful, though having read this I don't think that two days will be enough. Alex Djain; Thank you very much Alex. It's an amazing city and the history - together with the water - is what makes it so unique. Fantastic article, it was great to see the overall history of Venice. 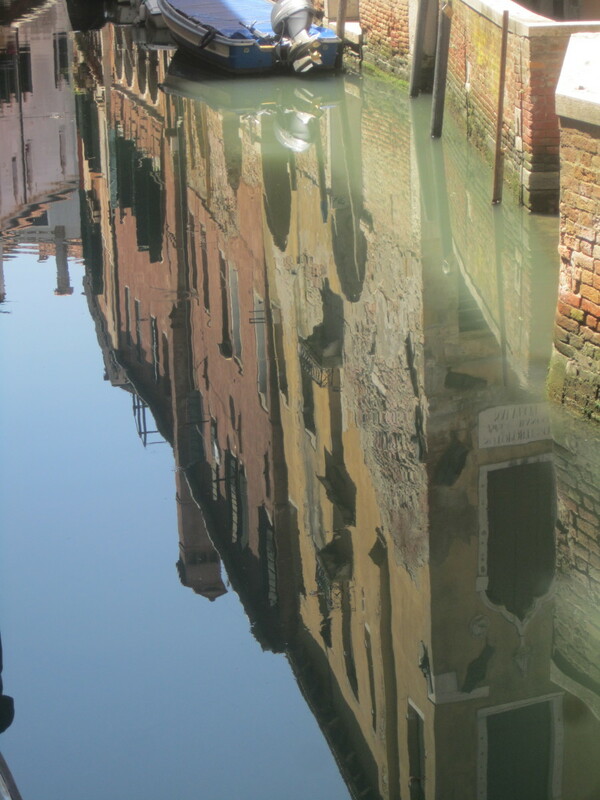 It can be so easy to get lost in the history of different aspects of Venice rather than get the bigger picture. peachpurple; Apologies for not replying sooner Peachy. It is a very attractive city, and particularly when viewed from the sea. Thanks. I don't know when I will ever make it there, but wonderful to visit via photos/story. Wonderful photos and informative for anyone visiting! stuff4kids; What can I say, except thank you very much for that lovely comment, which I'll treasure. So nice of you. Writing the hub did involve a lot of work. But of course it didn't really feel like work, because it was so interesting researching Venice's remarkable history, and then so pleasureable imparting information which hopefully will help visitors to enjoy their first experience of Venice even more. Excellent information, great photos and a personal angle on the pros and cons of visiting this incredible city. Your hard work and neat presentation appeal - history, culture, architecture - it's all here. Super job. Oh Alun, this is surely a masterpiece. You've put such a lot of work into this and it shines through in every word and such wonderful photographs to accompany the faultless and fascinating text. I hope this is widely read - I feel as if I have been to Venice already just after reading this. And to think that the great city of Venice as we now know it was once more or less a refugee camp! There are so many things I could mention but there is an embarrassment of riches here - better to simply thank you and encourage others to read it, too. So, I've shared this with my followers and on my Twitter feed. Oh, and I'm glad you had such a marvellous time in Venezia and that ylu thought to share it with us. The history, art and architecture makes Venice seem so inviting. So glad I could view a piece of it through your pictures. Thanks for an interesting article! My Bell; Thanks very much Marcelle, and I hope you get those articles published soon! There's certainly more than enough material for plenty of articles about the cities - Rome, Florence, Genoa, Verona, Pisa, Bologna, Siena etc etc - let alone the countryside of Italy. Great country to visit for anyone who loves history, culture or rural landscapes. My gratitude for your comments, Marcelle. Well done hub! I just got back from two weeks in Italy but only traveled through Tuscany and Rome. I've published an article already on visiting the Vatican but haven't yet got around to my others but your article here has inspired me to get writing. I took great notes so now it's just carving out the time. 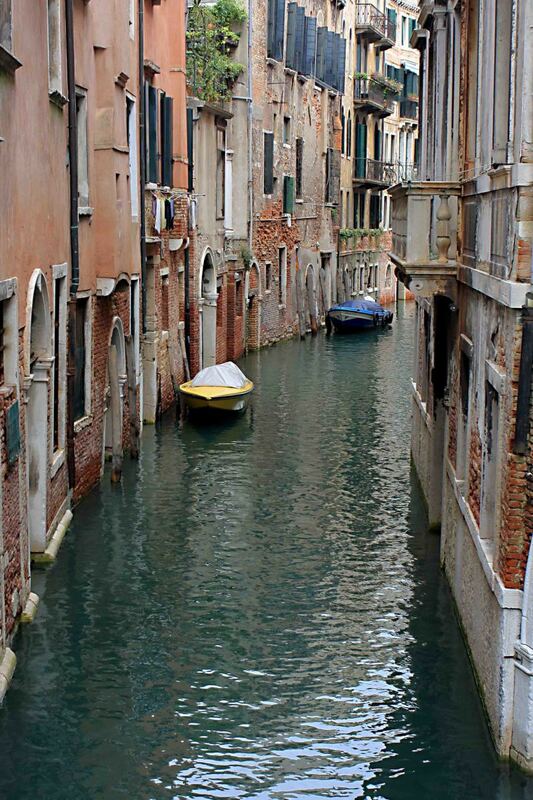 I now want to go to Venice! bdegiulio; My thanks for your generous remarks. For the benefit of anyone else who reads this comment, I can repeat what I have previously said to you elsewhere. Your article referenced above was one which I printed to take with me to Venice, and which I found useful. Most who visit Venice are only there for 2 or 3 days at most, so it really is valuable to have a quick guide to the key sights and experiences to make the best use of one's time, and your hubpage provided that. Even so, there were still quite a few sights I didn't get to see! I guess I'll have to plan another visit :-) Thanks Bill. Hi Alun. What a complete and comprehensive review of Venice. I'm so glad you had the opportunity to visit. What a magical place Venice is, certainly like no other place that I have been to. Great job adding the historical aspect of Venice and many thanks for the plug. Looking forward to your other Venice hubs that you are working on. Wonderful travel log. I thought your history section was just great. Thanks for bringing back the memories.